Dario Robleto: Life, Left to Struggle in the Sun, 2014. 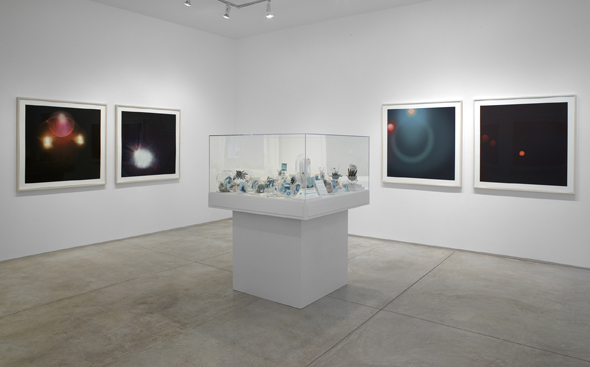 Exhibition view, Inman Gallery, Houston, 2014. Inman Gallery is pleased to present Life, Left to Struggle in the Sun, an exhibition of recent work by Dario Robleto spanning both galleries. This is Robleto’s sixth solo show with the gallery since 1999. When NASA launched the Voyager spacecraft in 1977, they included a 12-inch gold-plated phonograph record on board. The record was a gesture of goodwill and a synopsis of the human experience for whoever might discover it. A committee chaired by astronomer Carl Sagan selected its contents: 115 images and a playlist of Earth sounds, from thunder to birdsong to Chuck Berry. A message whose optimism outstretches its scientific foundation, the Golden Record has fascinated Dario Robleto since childhood. It represents the convergence of two of his favorite themes: the cultural synthesis of a mix-tape or a dj set, and the expanding boundaries of human understanding. While the Golden Record has been central to his recent work, Robleto, characteristically, doesn’t limit himself to any one topic or era. He has an alchemist’s zeal for alloys and compounds but a historian’s penchant for context and analysis. He breaks down as much as he fuses together. In keeping with those opposing impulses, this exhibition is a collection of collections, related but divergent. Each sculpture or series of wall-works delves into its own specific field with an attention to detail that can suggest whole new areas of investigation. Each is its own Golden Record, launched to a different corner of Robleto’s universe. Two teeming assemblages (both titled Setlists For a Setting Sun, with separate subtitles) are the Golden Record’s closest relatives in the show, each grown from one supporting historical detail: Dark Was the Night tells the story of Blind Willie Johnson, whose song of the same name was included on the record, while The Crystal Palace traces a necessary technological precursor, the world’s first live recording, to London’s Crystal Palace. The cyanotypes, seashells, homemade crystals and countless other curiosities filling the two vitrines hum with connections, excursus and subplots whose dizzying scope and historical depth reemphasize just how tightly packed the Golden Record really was. Surrounding Setlists For a Setting Sun in the main gallery is a suite of eight digital prints collectively titled The Sky, Once Choked With Stars, Will Slowly Darken. The images are taken from the covers of concert albums, their now-deceased headliners digitally removed. Without their “star,” the remaining stage lights become stars themselves, and the otherworldly Hubble-like images project the absent musicians to more distant, but possibly more enduring, spheres. The show’s title work, a grid of 16 cyanotypes printed from writers’ and musicians’ drawings and handwritten notes, is likewise an homage to Robleto’s artistic heroes. The density of information—in the cyanotypes’ scribbled revisions and the connections from print to print—suggests that a network of personal, artistic and scientific relationships underlies every individual achievement. If Life, Left to Struggle in the Sun and The Sky, Once Choked With Stars skew towards Robleto’s identity as a music fan, The Moon Won’t Let You Down, in the south gallery, highlights his interest in astronomy. The maple box is an anthology of amateur photographs of “super moons” (full moons at the point in their orbit closest to Earth) and a celebration of amateurism when that word had more to do with love than credentials. Dario Robleto is perhaps best known for his meditations on loss and absence, but a group of outsized personalities, still vital, congregates around these new works. Thomas Edison, inventor of the phonograph and the lightbulb, and Joseph Paxton, gardener, engineer and architect of the Crystal Palace, crop up in Setlists For a Setting Sun. John Herschel, inventor of the cyanotype and celebrated astronomer, is behind The Moon Won’t Let You Down. And every corner of the exhibition invokes Carl Sagan and Anne Druyan, Sagan’s wife and the musical director of the Golden Record. Though not traditionally considered artists, these wide-ranging intellects, unrestricted by topic or sub-discipline, serve as models for Robleto’s own omnivorous curiosity. Always attracted by frontiers—the deep sea, the brink of the solar system, the edge of death—Robleto is following his practice, and the examples of these polymaths, into his own borderland, where distinctions between art and science, amateur and professional, matter less than the spirit of inquiry and the earnest desire to understand what it means to be human. Dario Robleto was born in San Antonio, Texas in 1972 and currently lives and works in Houston. The artist has had over 30 solo exhibitions since 1997, most recently at the Des Moines Art Center (2011); the Museum of Contemporary Art, Denver (2011) and New Orleans Museum of Art (2012). A solo exhibition titled The Boundary of Life is Quietly Crossed is currently on view at The Menil Collection, Houston through January 4, 2015.